Celebrate play at Mexico: Festival of Toys! Chicago Children’s Museum’s vibrant new exhibit showcases a collection of more than 600 one-of-a-kind toys, on loan from Papalote Children’s Museum in Mexico City. Spanning nearly a century, these toys offer a window into Mexico’s rich history and come to life through a playful array of hands-on experiences designed for the whole family. The DIY Toy Workshop, where visitors become toymakers and build their own vehicles, dolls, or puppets. A Wheel Track to test the speed of toys that go! Small Worlds, a dynamic landscape for creating and decorating miniature dwellings. A Puppet Theater, where kids can design their own puppets and put on a show. Rattle-Rama, a sensory-rich space dedicated to the youngest visitors. A Seek-and-Find activity that encourages families to explore the Papalote collection together. Bring your family to view these unique treasures from Mexico and experience the joys of Toys! Papalote Museo del Nino is the originator of the Mexico: Festival of Toys exhibit, with support from Maseca and Distroller. Interactive exhibit experiences were designed and developed by Chicago Children’s Museum. SEATTLE /PRNewswire-FirstCall/ — Customers can now book travel on Alaska Airlines for service between San Diego and Puerto Vallarta, Mexico, beginning Nov. 12, 2010, subject to approval by the Mexican government. The flights are in addition to the carrier’s existing Puerto Vallarta service from Los Angeles and San Francisco. Flights are available for booking today at alaskaair.com or by calling 1-800-ALASKAAIR (1-800-252-7522 or TTY/TDD line 1-800-392-0228). Alaska Airlines and Horizon Air, subsidiaries of Alaska Air Group (NYSE: ALK) , together serve more than 90 cities through an expansive network in Alaska, the Lower 48, Hawaii, Canada and Mexico. Alaska Airlines ranked “Highest in Customer Satisfaction Among Traditional Network Carriers” in the J.D. Power and Associates 2008, 2009 and 2010 North America Airline Satisfaction Studies(SM). For reservations, visit alaskaair.com. For more news and information, visit the Alaska Airlines/Horizon Air Newsroom at alaskaair.com/newsroom. Ecotourism travel agency Ceviche Tours and the Isla Mujeres Department of Tourism announced today the dates for the Third Annual Whale Shark Festival, a community extravaganza celebrating the beauty and culture of Isla Mujeres, Mexico, and championing the need to preserve a fragile marine ecosystem. Last year thousands flocked to the family-friendly Whale Shark Festival, which offers guests an opportunity to participate in ecotourism adventures such as swimming with whale sharks, the largest fish in the ocean and an endangered species. The Whale Shark Festival is an effort to raise awareness of the need to preserve the area’s marine ecosystem. Isla Mujeres is part of the second largest barrier reef on the planet, and serves as the nursery of the Caribbean and the migratory path of whale sharks as well as sea turtles, water foul and game fishes. Guests can swim with whale sharks and participate in a wide array of family-friendly activities such as traditional dancing performed by local troupes, exploring ancient Mayan ruins and much more. Additionally, scientists from around the world will attend to present a series of Academic Seminars on marine biology, sustainable ecotourism and Mayan architecture. 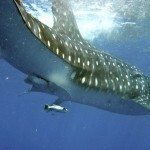 Travel arrangements and bookings for whale shark tours can be made through Ceviche Tours (www.cevichetours.com). For a complete listing of 2010 Whale Shark Festival activities and for more information, visit www.whalesharkfest.com or www.cevichetours.com. Ceviche Tours is a US-based ecotourism travel agency that provides sustainable ecotourism to the indigenous peoples of Isla Mujeres, Mexico. Founded by John and Adriana Vater of Spa Adriana in Huntington Village, NY, with longtime friend and Isla Mujeres native Luis “Cuco” Refugio and his family, Ceviche Tours works with the indigenous islanders of Isla Mujeres to help preserve their culture and maintain the integrity and beauty of the surrounding marine environment. Through education and photo identification efforts, Ceviche Tours joins the worldwide effort to protect and preserve whale sharks. As participants on our whale shark tours, guests are invited to be part of those identification and tracking efforts. For more information, please contact www.cevichetours.com.